Farr Brew was founded for one reason, and one reason only, to make great tasting beer and bring it to the public. Founded in 2014 Farr Brew is the brain child of Nick Farr, a man with an enthusiasm for top quality ale who started his brewing journey in 1999. He was soon joined by long-term friend Matt Elvidge who brings his experience from years of working in the creative and sales industries to the role of Sales Director. Farr Brew was founded on the principles of creating great tasting real ales brewed with craft and a commitment to quality. This vision has seen our beers stocked in a great and growing range of top quality beer shops and brilliant pubs. We also regularly attend events across Hertfordshire selling our wares and offering free samples to quench the thirsts of the masses all served up by ‘The Best Bar Staff, by Farr’. Porter, by Farr’ was chosen by acclaimed beer writer Roger Protz to be featured in a private tasting event. We went on to be runners up in the Hertfordshire Beer of the Year competition. Buoyed by this success, and through a combination of crowdfunding and private investment, funds were raised to move to a 1722sqft facility in Wheathampstead, Hertfordshire. The site was extensively refurbished to include a new 10 barrel brewery (that’s a whopping 2885 pints per brew), tap room and bottleshop. This new microbrewery represents a new chapter in the Farr Brew story and we look forward to it becoming a hub for beer enthusiasts from across the county, the country and indeed the world. With plans for brewery tours, beer tasting evenings, summer bar-b-ques (or should that be Farr-b-ques?) and open brewing days in the coming months and years the future couldn't be brighter for Farr Brew. Bottled, labelled and ready to go, another batch of top notch Farr Brew beer awaiting delivery to a lucky customer. It's a tough job but someone's got to do it! We're fastidious about testing Farr Brew to ensure it meets with our exacting standards. Are these the luckiest hens in the world? 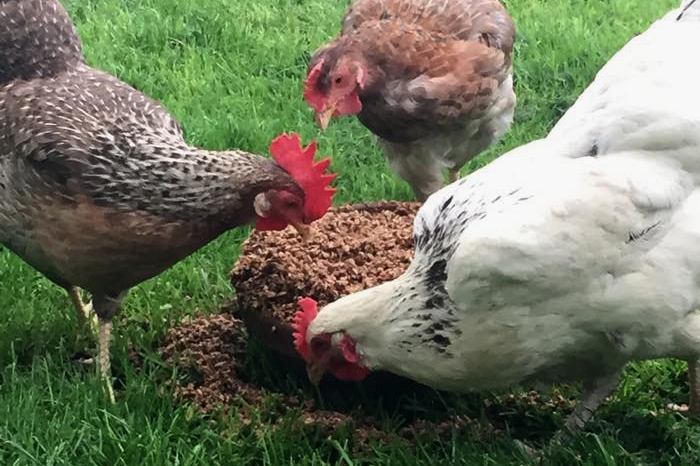 The girls at the Farr Brew small holding get to enjoy the spoils of our spent grain.